Viruses enter cells and take them over, but to get inside, they need a handhold. HIV pulls itself in by grabbing onto a protein called CCR5, which decorates the surface of T-cells, which are one of the two major types of white blood cells and play an important role in helping the body fight infections. Back in the 1990's, researchers took interest in a handful of promiscuous gay men who were able to engage in sexual relations with their HIV-positive partners with impunity. 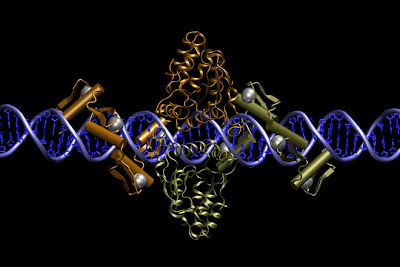 Most of them had a mutation that kept their cells from producing normal CCR5 protein. Armed with that knowledge, scientists have developed several tactics to block the production of CCR5 or perturb its shape so that the HIV virus can't grab onto it during the first step of its hijacking attempt. The strategy is much akin to cutting your hair before a wrestling match: It gives your opponent one less thing to grab onto. June tested the procedure on cultured T-cells and mice -- not humans -- so it should be a source of guarded optimism, because it's not certain the technique would work in humans. In theory, AIDS doctors could take some T-cells out of an infected person, edit their genomes, and stick them back into their patient. Once they have returned to the body, each resistant cell will thrive and multiply in spite of the disease. This trick would not eliminate the virus, but it might be able to permanently raise the T-cell counts of AIDS patients, increasing their ability to resist secondary infections and remain healthy. Image: A zinc finger nuclease clips the CCR5 gene out of a T-cell. Courtesy Sangamo Biosciences.